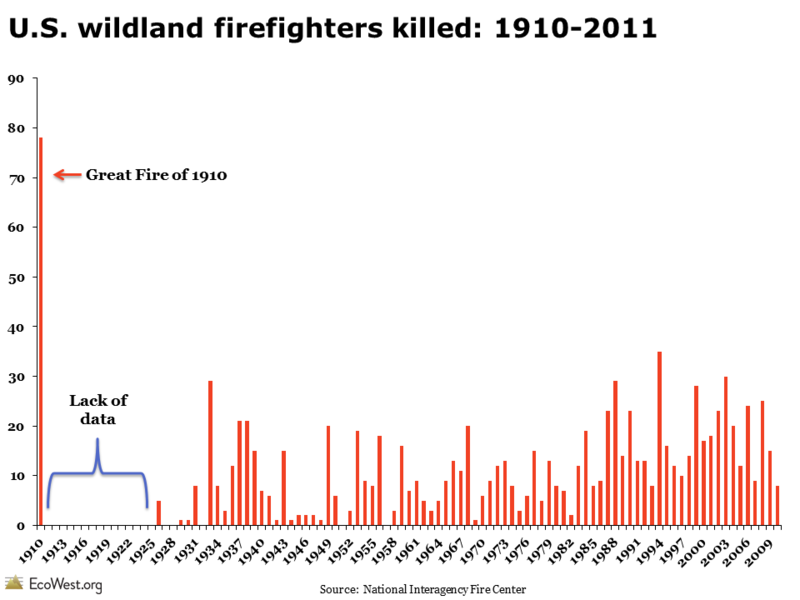 The shocking deaths of 19 firefighters yesterday in Arizona is a grim milestone in the history of wildland firefighting. 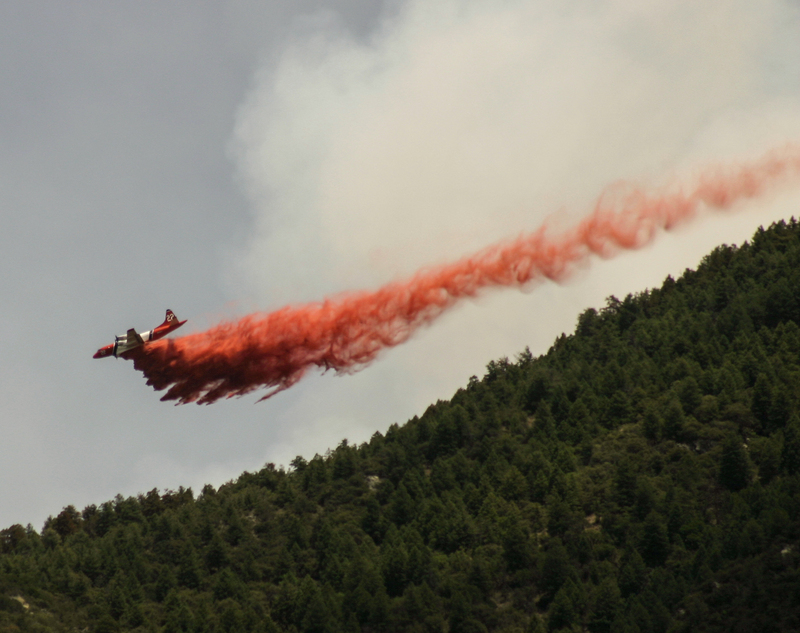 Will the Yarnell Hill Fire also be a watershed event in how this nation approaches wildfires? Sadly, it often takes a national tragedy to raise awareness of problems and force action on solutions. We know wildfires are getting larger, more people are living in the fire-prone wildland-urban interface (WUI), and climate change will only make the problem worse. What remains to be seen is whether the disaster will lead to changes in how the nation approaches the wildfire issue. Will it lead to more funding for hazardous fuels reduction and prescribed burns? Will it spur more regulations on development and building practices in the WUI? 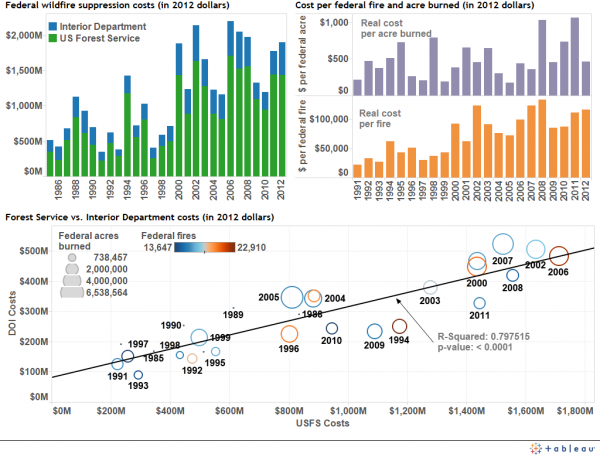 Will it change how wildland firefighters do their work and make fire managers more risk averse? Looking back over the past century, I think the Yarnell Hill Fire ranks up there with the Great Fire of 1910 (see Stephen Pyne’s Year of the Fires and Timothy Egan’s The Big Burn) and the Yellowstone Fires of 1988 (see Rocky Barker’s Scorched Earth) as defining moments in the history of U.S. wildfires. The 1910 inferno led to a massive increase in fire suppression; the Yellowstone blazes resulted in greater appreciation of fire’s benefits for many Western ecosystems. 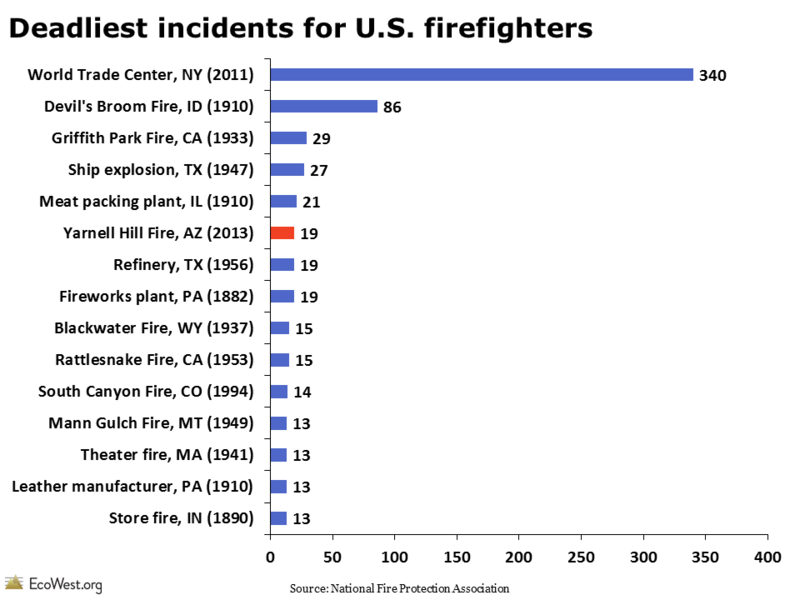 The loss of 19 firefighters in one incident is actually a historic event for all of U.S. firefighting, not just the wildland form. It’s the greatest loss of life since 9/11 and it’s tied for sixth on the all-time list. 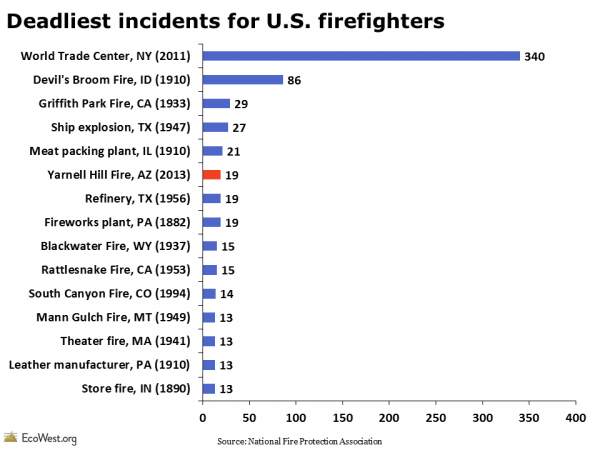 Notice in the graphic below that almost all of these incidents happened decades ago (this data, from the National Fire Protection Association, has slightly different numbers for wildfire deaths than what the National Interagency Fire Center reports). While the details from yesterday’s burnover are just emerging, we’ve known for many years that a tragedy like this could happen. We’ve had so many bad wildfires over the past decade or so that it seems the American public and media have become desensitized to hearing that hundreds of homes have been destroyed or hundreds of thousands of acres are ablaze. The loss of 19 firefighters, however, is anything but normal and hard to ignore. The cynic in me says it may take a huge civilian death toll to really elevate the issue in the national consciousness. 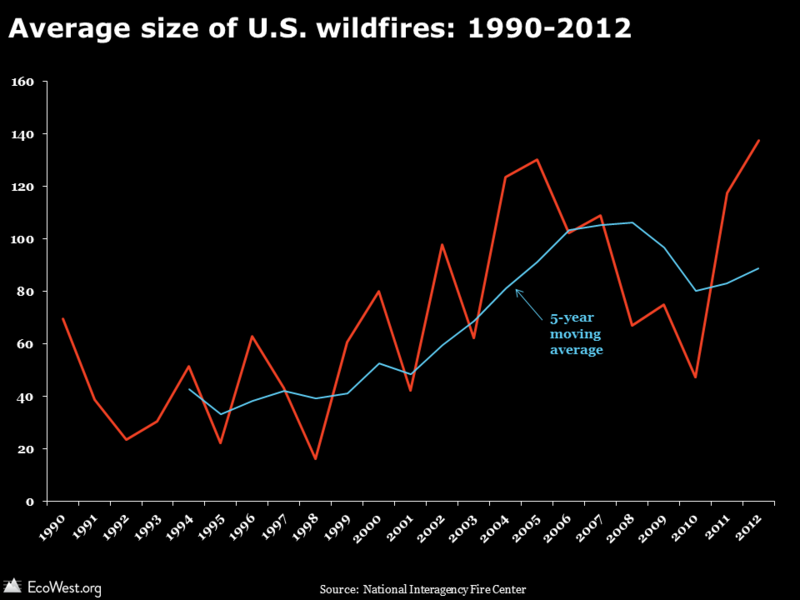 The graphic below shows an upward trend in the average size of U.S. wildfires since 1990. 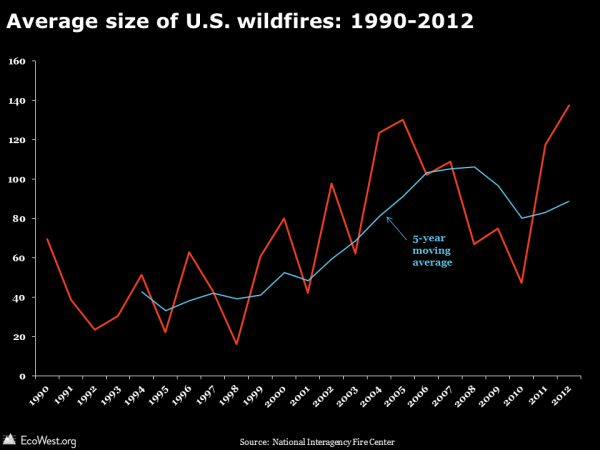 This is very high-level national data, but in another post we provide more detail on the increasing size and intensity of wildfires in the West. 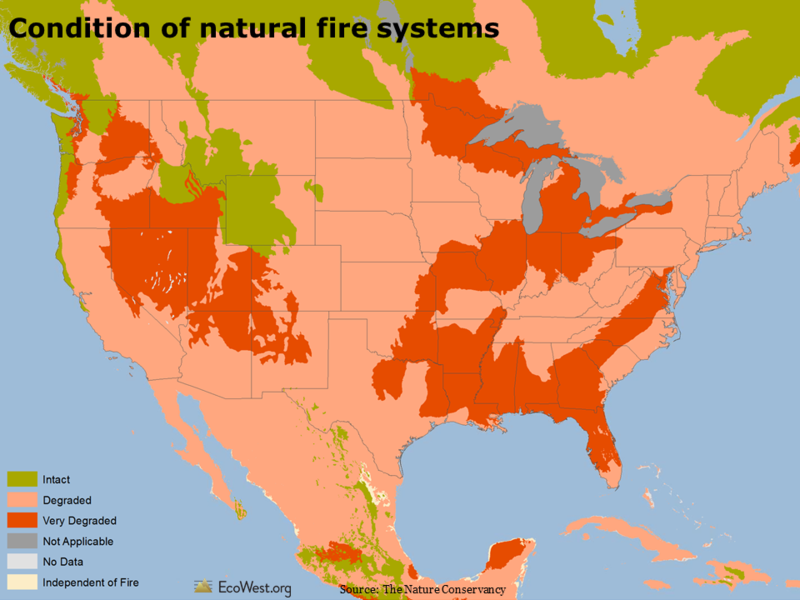 Decades of fire suppression in forests, woodlands, and grasslands that frequently burned under natural conditions has led to an excess of fuel in some areas. The map below shows that the natural cycle has been degraded in nearly all U.S. ecoregions, according to an analysis by The Nature Conservancy. 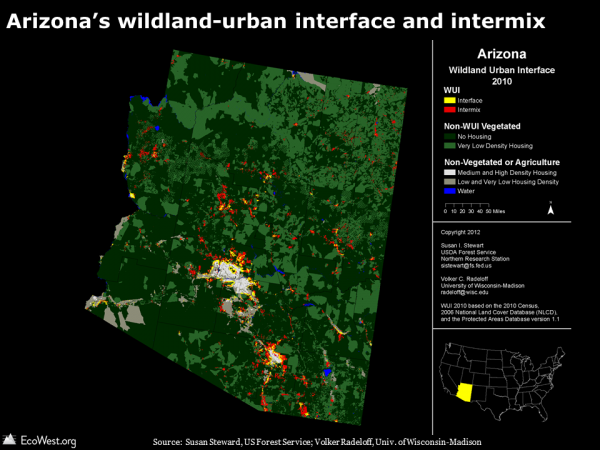 The map below shows where homes are most at risk from wildfires in Arizona. As the West’s population has risen, so has the number of people living in these higher-risk areas. Learn more about the WUI in this post. 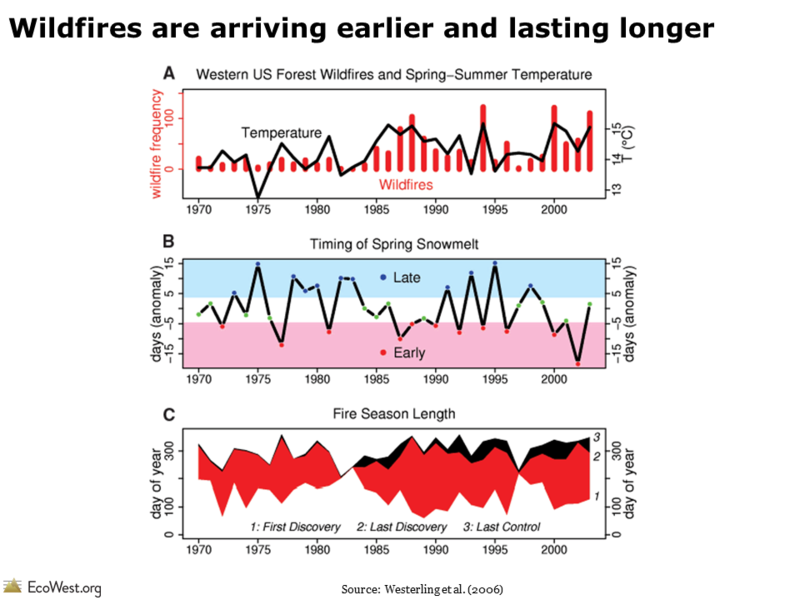 Scientists have already found that the warming experienced over the past few decades in the West has led to an increase in wildfire activity. 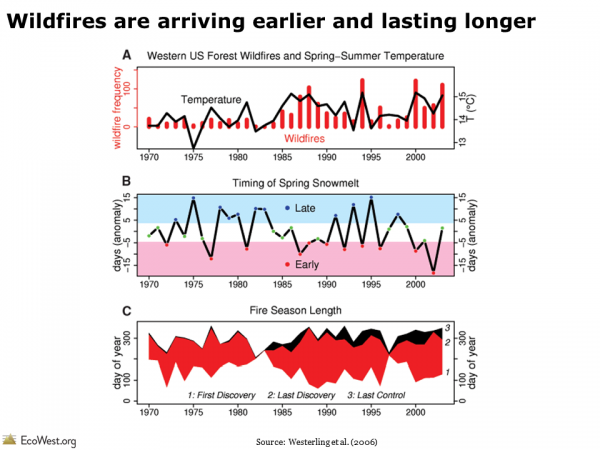 A 2006 paper in Science (graphic below) concluded that “large wildfire activity increased suddenly and markedly” starting in the mid-1980s, with most of the change due to a warming climate rather than fire suppression. Higher temperatures led to a thinner snowpack that melted earlier in spring, leading to more-flammable conditions in summer and a lengthening of the wildfire season by an average of 78 days. We have more analysis and data on our main fire page and on dashboards that cover fire trends, suppression, firefighters, ignition, fuels, and the WUI. Wildfire metrics send a clear signal that this problem is getting worse, especially in places like Arizona, but solutions are anything but simple. There’s no quick fix for forests and woodlands that are ecologically out of balance due to a century of fire suppression. There are already millions of homes in vulnerable locations and only so much that homeowners can do. Some local communities have taken big strides toward reducing their vulnerability and discouraged building in the WUI, but there is political resistance in the West to statewide mandates. 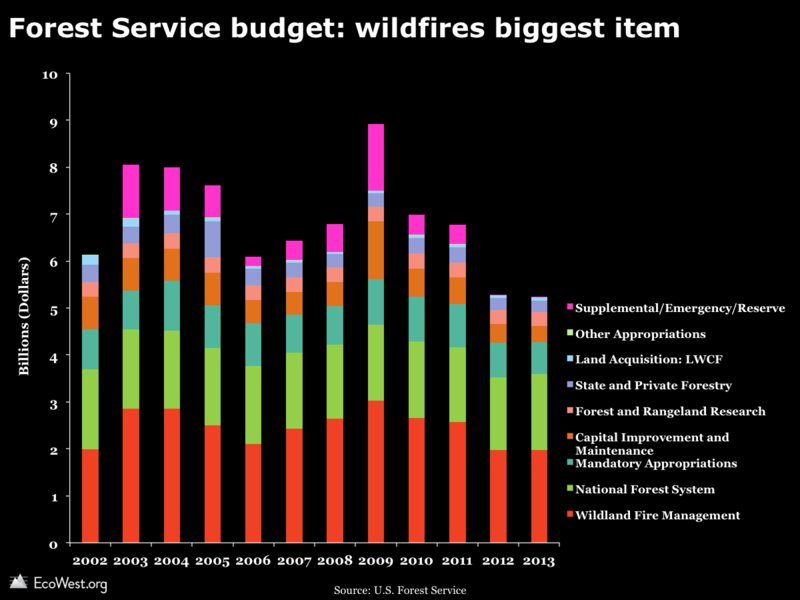 Fighting wildfires will always be an inherently perilous business, but perhaps the Yarnell Hill disaster will force the public and policymakers to confront this increasingly dangerous issue, evaluate the options, and take action. The Arizona Republic is reporting tonight that 19 firefighters have died in the Yarnell Hill Fire. 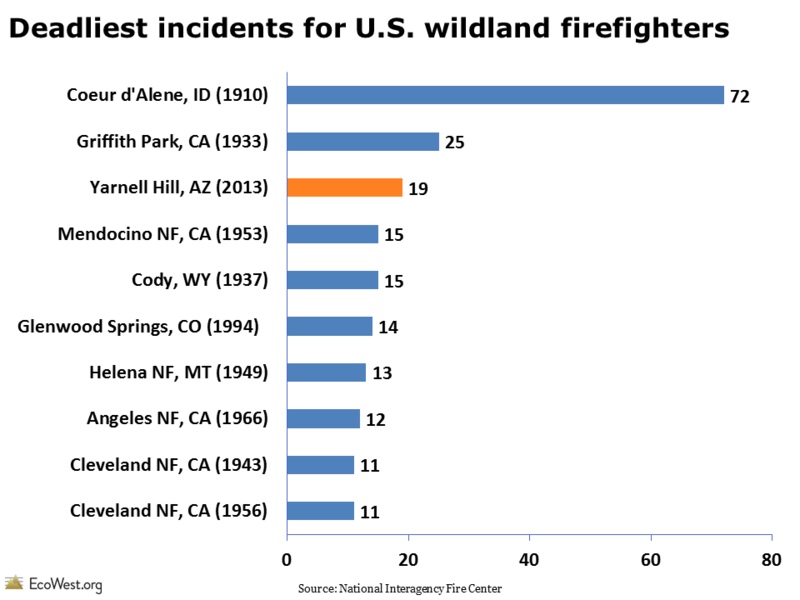 This disaster looks to be the third-deadliest incident in the history of U.S. wildland firefighting and the highest number of deaths in a single episode since 25 were lost in a 1933 fire in Griffith Park, California. 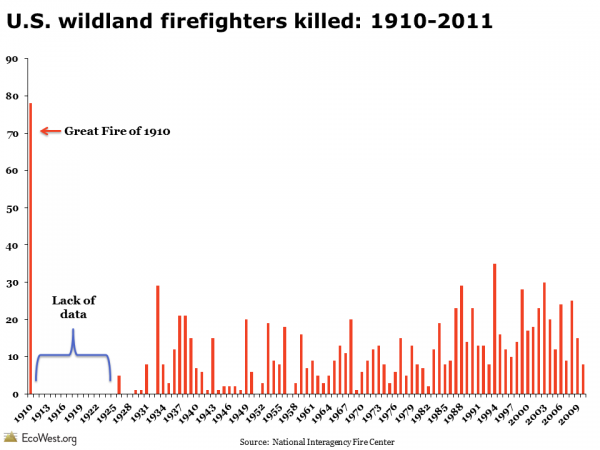 The Great Fire of 1910 in the Northern Rockies claimed 72 lives, but there is a lack of data on firefighter deaths in the subsequent two decades. We just published a post on wildland firefighter fatalities, based on data from the National Interagency Fire Center that is available here. I’ve extracted all of the incidents in which more than 10 firefighters died and sorted them in the chart below (data is only available through 2011). A burnover was responsible for all of the deaths in the incidents shown above. You can explore this data and download images on our dashboard page.